Both Kyle Jones and Amelie Kretz defended their national titles at the Canadian Triathlon Championships in Magog, Que. on Saturday. 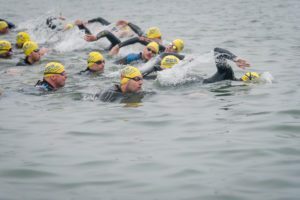 The race was held in conjunction with the ITU Pan American Cup. Jones is on a winning streak winning two Pan Am Cup events in as many weeks after beating out his competition in Toronto last weekend. Jones is perfectly poised for success as he heads into the 2014 Commonwealth Games in Glasgow, Scotland. He won the sprint distance race in 54:48:08 edging out American mile record holder-turned triathlete Alan Webb in 53:50.7. Kaleb Vanort rounded out the men’s podium in third at 53:53.0. Alexander Hinton, of Kingston, Ont., was in the mix until midway through the run where he dropped off the pack to finish fourth at 54:03.08, giving him second place in the National Championships. Meanwhile, Amelie Kretz, also won her second-straight Canadian Championship. Having been off for most of the season with injury, the Blainville, Que. native is back to action wining with a solid margin 1:02:14.8. Kretz pulled ahead of friend and training partner, Joanna Brown of Carp, Ont., who secured the silver medal with a time of 1:02:45.1. American, Summer Cook, grabbed the bronze at 1:03:01.2. Russell Pennock and Emy Legault won the Junior National Championships in 56:32 and 1:05 respectively. Pennock held finished almost 10 seconds ahead of second place Jeremy Briand (56:42). Myles Zagar was third in 57:00. Legault was well ahead of her competition finishing with a cushion of 30 seconds. Elizabeth Boutin was second in 1:05:31 and Samantha Klus was third in 1:06:03. Later in the day Canada’s top paratriathletes hosted the world for the ITU World Paratriathlon. Calgary’s Stefan Daniel remained unbeaten this year in the men’s TRI 4 arm impairment classification. The 17-year-old promising star in international paratriathlon shattered the field with a time of 1:00:20. American Chris Hammer finished second at 1:03:16, while Rafael Solis Torres, of Spain, grabbed the bronze with a time of 1:11:15. Canada also won four silver medals in paratriathlon races in Magog. Grant Darby, of Hamilton, Ont. was second in the men’s TRI 2 classification and Ottawa’s Kim Fawcett was also second in the women’s TRI 2 class . Winnipeg’s Chantal Denholm was second in the women’s TRI 4 (arm impairment) and Ottawa’s Christine Robbins was second in the women’s visually impaired category.